As of this morning my computer is up and transmitting for the first time since we moved. What a relief to have my trusty keyboard and monitor and all that goes with it. While unpacking boxes and hanging artwork in our new house I planned my next pieces. My friend, Hannah Hunter has invited me to participate in a show in Davis, California. The event will take place at the end of this month. I will send “Good-Bye” the lady in the yellow and pink dress, but wanted two new pieces for the California debut. 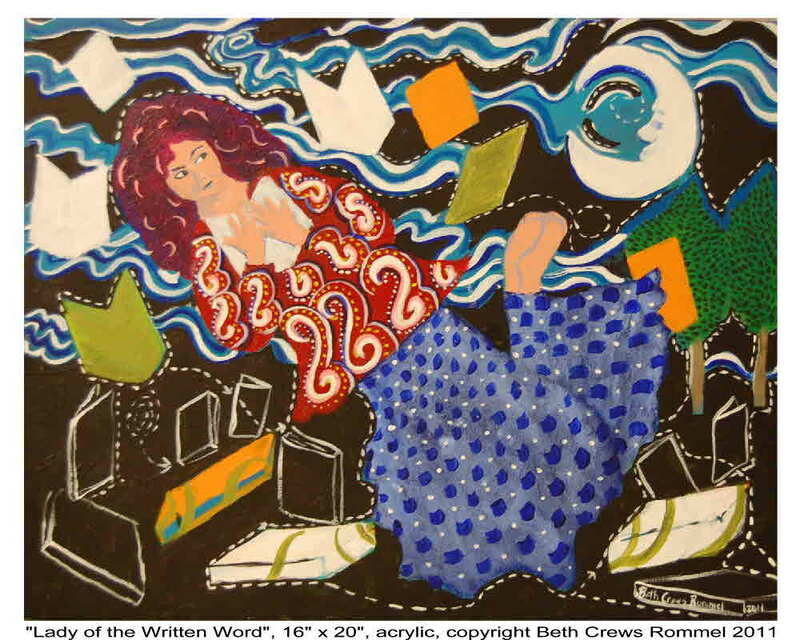 With this show in mind I have created “Lady of the Written Word”. Maybe it is the many boxes of books I moved, or the 20 bags of books I donated to charity before we moved, or the love I now have for my Kindle that prompted this piece. I was one of those folks who said I need to have the sensory experience of touching the cover and turning the pages. I was after all a librarian and have always wanted to illustrate children’s books. Last night after switching off my trusty Kindle I realized it is the words in the book that hold me spellbound. The turning of the pages is okay, but the fact that I am building my own library in a slim volume of my own is pretty fantastic. I marvel at all of the words I can hold in my hand and access in an almost weightless volume. Maybe the next painting of the “Lady of the Written Word” should be a figure with a Kindle flying happily as she holds her complete library in one hand. She won’t be groaning as she carries boxes of her treasured tomes up several flights of stairs.